Opposite day! We departed from another slip due to Fisherman's Landing Tackle Shop's Tackle Day events! Made it! Todd almost missed boarding while searching for parking! Dan shows off his hand-shaped swordfish "sword"
Chester means business! Look out, fish! Trip 33 arrived to Guadalupe Island on Sunday and got busy! John Lindsey finishes strong on Wednesday before heading back! 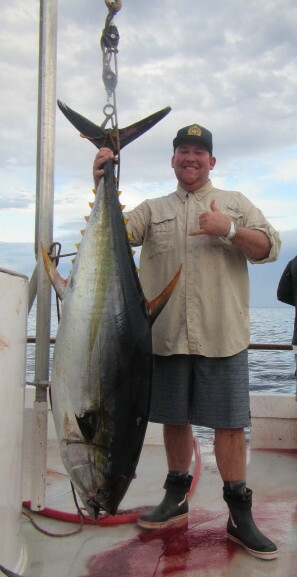 Jim Mabary and his 151# catch. Boat returned this morning! Check out the jackpot results! Randy L. with one of his TWO jackpot-winning fish! Todd Adamson with a nice one! Chester with a nice catch! Using the rail is recommended with 100# class tuna! Anne L. with a "lifetime fish"
Thom came armed for battle with a new custom rod from his favorite Ventura tackle shop! Chester has a happy day! Sure gets dark early now that we changed the clocks for Daylight Saving Time!